GRAND FINALE: The Micro High Cinematic Televised Movie Thing follows the gang as they head out into the adult world and brush up against some old adversaries. Bradford, KR, Apr 1 – Fans of hit cartoon series Micro High were not left disappointed this morning with the midnight premiere of its long-awaited film adaptation, with many who attended the event lauding the experience as fitting for the spirit of the show. The Micro High Cinematic Televised Movie Thing made its debut at 12:01 this morning at Bradford’s Ilaf Theatre to a large crowd of moviegoers, all of whom were eager to see the film that has been promised since April last year. The movie focuses on the cast of the show in their first year away from school as they try and make their way in the world, only to come up against their nemeses from the Wikia Academy for Numpty Kids (W.A.N.K.) who have old scores to settle. Movie critic Edsel Pinto praised the movie as “a rollickingly good laugh almost indistinguishable from the television series”, noting that “the direction and scripting is second-to-none, and I dare say it eclipses even the most hilarious moments we saw on the box”. The movie was produced by animation studio Fern Tree and funded by the Siroccan Broadcasting Corporation, who in a statement said it was “great to bring back the show so many people loved”. Animation for the film was done via cartoon software UIdio.t, which gave the cast slightly different appearances from the Xtranormal days. Despite some reservations from test audiences, Fern Tree defended the decision, saying that it allowed the characters more freedom of movement as well as a range of costumes and movements not available with Xtranormal, as well as full 1080p High Definition output. The film had been slated to be given an R16 rating, but editing and negotiations saw this lowered to a 14 rating, making it more accessible for the show’s fans. 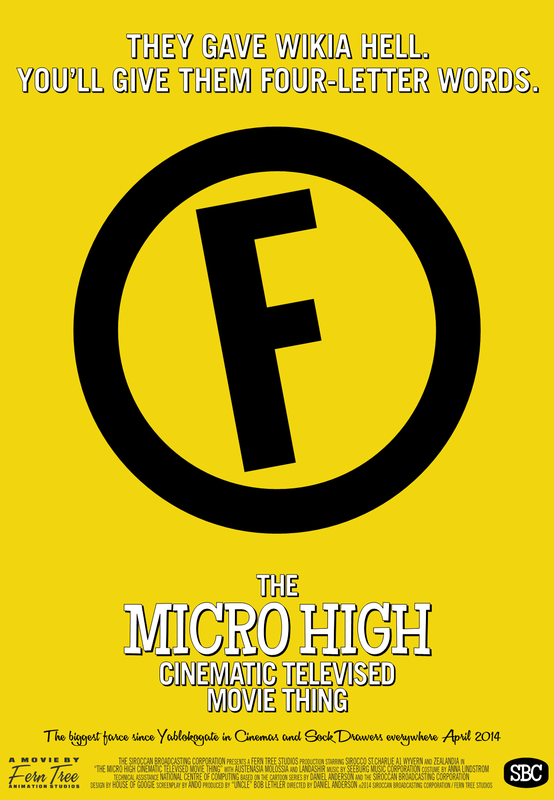 The Micro High Cinematic Televised Movie Thing is scheduled for international release in Zealandia and Wyvern tomorrow; St.Charlie, Erephisia, Austenasia and Juclandia on Saturday and the wider micronational community next week. Dates for the television, Blu-ray, DVD, VHS and Betamax releases of the film have not yet been confirmed by the SBC.